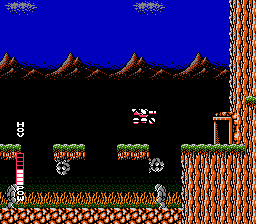 Blaster Master is an action-adventure game that was known as Metafight on the Nintendo Famicom. Your mission is to rescue your frog that's fallen into a radioactive hole, and destroy the Plutonium Boss of the underworld. There's eight levels and the basic action consists of two styles; the majority of the time is spent in side-scrolling areas where you drive an armoured vehicle while shooting enemies and exploring. The Select button allows you to travel on-foot, and if you then find one of the small doorways the action changes to a top-down view where you fight mutants, hunt for power-ups and attempt to locate the end-of-level boss. While the gameplay is exploration based like Metroid (1987, NES), it's basically a much better version of Sunsoft's Fester's Quest (1989, NES), due to its similar power-up system and multi-angle stages. Your vehicle is nimble and controls great, while its numerous abilities and power-ups give it a large number of ways to tackle enemies and levels. One of the game's best features is its focus on upgrading your weapons and abilities after you beat each boss, similar to Double Dragon (1988, NES). It's a fun, engaging system that makes you want to continue seeing what lies ahead. The majority of the level design is superb, with huge areas to explore and lots of opportunities for power-ups. Stage 4's side-scrolling area is a highlight, as towards the end it forces you to travel on-foot to unlock a door from the other side in order to allow your vehicle to pass through; it's daunting due to your limited on-foot abilities, making for some intense moments! The level design does falter at times though, particularly at the end of Stage 3; here, players somehow need to know to backtrack to the beginning of the game so they can use a new Hover ability and access the next level... all with zero hints! Blaster Master is a lengthy and addictive adventure game that wraps you up inside its enticing and well thought-out world. The level design, while mostly excellent, could have used some refinement, but it's still full of standout moments and the fact that each stage can be tackled in multiple ways gives it lots of replayability. Random trivia: In 2017, the game was remade and released as Blaster Master Zero on the Nintendo 3DS and Nintendo Switch.